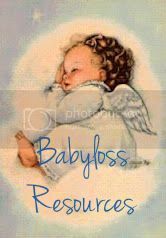 Today I took some time to update my Babyloss Resource Page, after finding plenty of new resources in the last couple years and realizing that some of the old links no longer work. What I have included are: Songs of Hope and Healing, Books on Grief and Loss, Movies/Documentaries/Short Films, Places of Support, Memorials/Keepsakes, Special Dates to Remember, Things to Participate In, Artwork, Jewelry, Photo Retouching, Connect With Other Loss Parents through Blogging, Retreats, and When You Know Someone Who Loses a Baby, and Places That Help With Infant Funeral/Burial Costs and Headstones. Please feel free to use any of these resources on your own blog/website and pass it along to your friends and family. I will be updating this list on a regular basis. If you know of any resources that have blessed you that are not listed, please let me know. Thanks and God bless!